Exact Measurement makes the recipe perfect. To get the desired taste, you need to add the ingredients exactly as the amount mentioned. Measurement Cup and Spoon sets keeps all the small measurements together. Having one of these ease our job in searching for spoons and avoid approximate measurements. Most measuring cups are made from metal, glass or plastic and use the standard 8 ounce ‘cup’ as the basic unit of measurement. 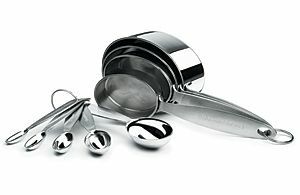 A typical set of measuring cups marks off many gradations, starting with a 1/8 cup measurement (similar to a tablespoon) and working through the common fractions found in recipes- 1/4, 1/3, 1/2 and finally 1 full cup. Any other proportions can be made through a combination of these cup sizes. Measures the dry and Liquid items. Essential for baking a cake or Cookie. could you share any ‘Vazhaikai’ recipes apart from poriyal,bajji and podimas?